The Bombardier CRJ700, CRJ900, and CRJ1000 are regional jet airliners manufactured by Bombardier and based on the CRJ100 and 200. Bombardier currently markets the trio of aircraft as the CRJ Series complementing its Bombardier Dash 8 twin turboprops marketed as the Q Series. Bombardier designed a larger plane, the C Series, but that is now majority-owned by Airbus and marketed as the Airbus A220. Following the success of the CRJ100/200 series, Bombardier Aerospace produced larger variants in order to compete with larger regional aircraft such as the Fokker 70/Fokker 100 or the BAe 146 family, and competed later with the Embraer E-Jet family. In 1995, the CRJ-X development was expected to cost C$300 million (US$200 million). By 1999, Bombardier had invested C$650 million (US$440 million) to develop the 70-seat CRJ700, and was to invest C$200 million more to develop the CRJ-900, stretched to 90 seats. The CRJ700 was then priced $24-25 million, and the CRJ900 was to be priced $28-29 million. Final assembly of the aircraft is at Montréal-Mirabel International Airport in Mirabel, Quebec, outside Montreal, Quebec, Canada. In 2007, Bombardier launched the CRJ900 NextGen to replace the initial version. Its improvements and conic nozzle enhances fuel economy by 5.5%. The new model has improved economics and a new cabin common to the CRJ700 NextGen and CRJ1000 NextGen. Mesaba Aviation (now Endeavor Air), operating at the time as Northwest Airlink (now Delta Connection), was the launch customer, and remains the largest operator of the CRJ900 NextGen. The Endeavor fleet of CRJ900 NextGen aircraft are configured in a two class seating configuration, with 12 first class seats and 64 coach seats. In 2008, the CRJ700 was replaced with the CRJ700 NextGen, featuring improved economics and a revised cabin common to the CRJ900 NextGen and CRJ1000 NextGen. In January 2011, SkyWest Airlines ordered four CRJ700 NextGen aircraft. It accounts for over 20% of all jet departures in North America and globally the family operates more than 200,000 flights per month. In 2016, Bombardier began offering a modernized cabin design for the CRJ Series with a more spacious entry, larger overhead bins, larger windows situated higher in the fuselage, newer seats, larger lavatories, and upgraded lighting. Maintenance intervals were extended to 800/8,000 hours. A checks every 800 flight hours and C checks every 8,000 start from summer 2018, and a new conic engine nozzle boosts fuel efficiency by 1%. The 60-100-seat airliner market is forecast by Bombardier for 5,500 from 2018 through 2037. Re-engining the CRJ like the Embraer E-Jet E2 with new, more efficient engines like the GE Passport instead of the current GE CF34, would not overcome the certification expense as newer engines are larger and heavier, eroding fuel burn improvements on short regional routes. As of November 2018[update], following Bombardier's decisions to sell the CSeries to Airbus and the Q Series to Viking Air, the company is looking at "strategic options" to return the CRJ to profitability. Analysts suspect that it may decide to exit the commercial aircraft market altogether and refocus on business aircraft. Design work on the CRJ700 by Bombardier started in 1995 and the programme was officially launched in January 1997. The CRJ700 is a stretched derivative of the CRJ200. The CRJ700 features a new wing with leading edge slats and a stretched and slightly widened fuselage, with a lowered floor. Its first flight took place on 27 May 1999. The aircraft's FAA Type Certificate designation is the CL-600-2C10. The CRJ700 first entered commercial service with Brit Air in 2001. Seating ranges from 63 to 78. The CRJ700 comes in three versions: Series 700, Series 701, and Series 702. The Series 700 is limited to 68 passengers, the 701 to 70 passengers, and the 702 to 78 passengers. The CRJ700 also has three fuel/weight options: standard, ER, and LR. The ER version has an increase in fuel capacity as well as maximum weight, which in turn increases the range. The LR increases those values further. The executive version is marketed as the Challenger 870. The CRJ700 directly competes with the Embraer 170, which typically seats 70 passengers. The early build aircraft were equipped with two General Electric CF34-8C1 engines. However, later build aircraft are now equipped standard with the -8C5 model, which is essentially an uprated 8C1. Most airlines have replaced the older engines with the newer model, while a few have kept the older -8C1 in their fleet. Maximum speed is Mach 0.85 (903 km/h; 488 kn) at a maximum altitude of 12,500 m (41,000 ft). Depending upon payload, the CRJ700 has a range of up to 3,620 km (2,250 mi) with original engines, and a new variant with CF34-8C5 engines will have a range of up to 4,660 km (2,900 mi). On February 6, 2019, Bombardier launched the CRJ550, based on the CRJ700, with 50 seats in three classes. The launch customer, United Airlines, ordered 50 aircraft configured with 10 first class, 20 Economy Plus and 20 economy seats, to be delivered later in 2019. The CRJ550 has a lower MTOW than the CRJ700 in order to comply with scope clauses in US pilot contracts, and is expected to receive type certification in the second half of 2019. The initial 50 aircraft will be sourced from existing CRJ700 airframes, rather than being newly constructed. Lufthansa CityLine Bombardier CRJ900LR taking off, 2010. The CRJ900 is a stretched 76–90 seat version of the CRJ700. The airplane is loosely based on the CRJ200 series with a few major improvements. The first CRJ900 (C-FRJX) was modified from the prototype CRJ700 by adding longer fuselage plugs fore and aft of the wings. It was later converted into the prototype CRJ1000 by replacing the fuselage plugs with longer plugs. The CRJ900 competes with the Embraer 175, and is more efficient per seat-mile, according to Bombardier. Mesa Air Group was the launch customer for the CRJ900 painted in America West livery. The FAA Type Certificate designation of the CRJ900 is the CL-600-2D24. Comair, operating as Delta Connection, ordered 14 CRJ900s, with at least 6 in service as of November 2007. These are in a two–class configuration, with 12 first class seats and 64 coach seats. This is due to a limitation in Delta's contract with its pilots which limits its regional carriers to flying 76-seat aircraft. The wing is wider with added leading edge slats, the tail is redesigned with more span and anhedral. The cabin floor has been lowered 2 inches which gains outward visibility from the windows in the cabin as the windows become closer to eye level height. Its maximum ground takeoff weight is 84,500 pounds. The aircraft features two GE CF34-8C5 engines, 59.4 kN (13,400 lbf) thrust with APR. The engines are controlled by FADEC digital engine control instead of control cables and a fuel control unit. The environmental packs have a target temperature instead of a hot-cold knob. The cabin has a recirculation fan which aids in cooling and heating. The APU is a Honeywell RE220 unit which supplies much more air to the AC packs and has higher limits for starting and altitude usage. In typical service the CRJ900 can cruise 8–10,000 ft higher with a slightly higher fuel burn and an average true airspeed of 450–500 knots, a significant improvement over its predecessor. In 2018, its list price was $48 million, its market value was $24M, most customers are paying $20–22M and the American Airlines order for 15 was at below $20M. A 2012 aircraft was worth less than $14M and it was to fall by 30% in 2021. The CRJ700 Series 705 is based on the CRJ900, with a business class cabin and a reduced maximum seating capacity to allow operation with regional airlines. The Series 705 seats 75 passengers. Some regional airlines have scope clauses with their major airlines that limit the maximum passenger capacity of aircraft they operate. The Air Canada Pilots Association negotiated a scope agreement with Air Canada limiting the maximum seating capacity of any jet aircraft at Air Canada Express to 75 seats. Air Canada Jazz was the launch customer for this aircraft in 2005 with 10 Executive Class and 65 Economy Class seats, all fitted with personal audio/video-on-demand systems. The FAA Type Certificate designation of the CRJ705 is the CL-600-2D15. Jazz Aviation, a subsidiary of Chorus Aviation, operates 16 CRJ705s on behalf of Air Canada and is currently the only operator of this version. On 26 April 2016, Jazz Aviation announced that existing CRJ705 aircraft in operation will be converted to CRJ900 standards. On 19 February 2007, Bombardier launched the development of the CRJ1000, previously designated CRJ900X, as a stretched CRJ900, with up to 100 seats. The CRJ1000 completed its first production flight on 28 July 2009 in Montreal; the entry into service was planned then for the first quarter of 2010. A month after the first flight, however, a fault in the rudder controls forced the flight-test program to be grounded : the program was not resumed until February 2010, and deliveries were projected to begin by January 2011. Brit Air and Air Nostrum were the launch customers for the CRJ1000. Bombardier Aerospace announced on 10 November 2010 that its 100-seat CRJ1000 was awarded Aircraft Type Certificates from Transport Canada and European Aviation Safety Agency, allowing for deliveries to begin. On 14 December 2010, Bombardier began CRJ1000 deliveries to Brit Air and Air Nostrum. On 23 December 2010, it was announced that the Federal Aviation Administration had also awarded a type certificate, allowing the CRJ1000 to operate in US airspace. Bombardier states that it offers better performance and a higher profit per seat than the competing Embraer E-190. The FAA Type Certificate designation of the CRJ1000 is the CL-600-2E25. In 2018, a new CRJ1000 discounted price is $24.8M, a 2015 model is valued $22.0M, a 2010 one is worth $15.5M for a $155,000 monthly lease, and it will be $12.0M in 2021 for a $145,000 monthly lease while its D Check costs $800,000 and its engine overhaul costs $0.9 to 2.4M. As of July 2018, 290 CRJ700 aircraft (all variants), 425 CRJ900 aircraft (all variants) and 62 CRJ1000 aircraft were in airline service with SkyWest Airlines (123), Endeavor Air (112), PSA Airlines (95), Mesa Airlines (84), GoJet Airlines (54), ExpressJet Airlines (39), Lufthansa CityLine (37), China Express Airlines (36), Scandinavian Airlines (26), HOP! (25), Air Nostrum (23), Envoy Air (20), Garuda Indonesia (18), and other operators with fewer aircraft of the type. Bombardier data as of 31 December 2018. 25 April 2016 CRJ900 Trident Jet for CityJet 4 −4 BBD Press Release. 26 April 2016 CRJ900 Jazz Aviation LP for Air Canada Express 5 5 BBD Press Release. 20 June 2016 CRJ900 Industrial Bank (China) 10 0 BBD Press Release. BBD disclosed the previously unidentified customer on 1 November 2016. 28 August 2018 CRJ900 Industrial Bank (China) -5 0 Order Conversion to Q400. 6 February 2019 CRJ550 GoJet Airlines for United Airlines 50 0 Launch customer for CRJ550. In September 2011, PLUNA received its eleventh airplane (from an eventual total order of 15 with options). Estonian Air ordered 3 CRJ900 NextGen 88-seat aircraft. Also, SAS ordered 13 of these in March 2008. Iraqi Airways has ordered six Bombardier CRJ900 NextGen airliners and options on a further four of the type. 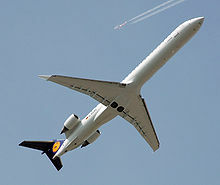 In June 2010, Lufthansa ordered eight CRJ900 NextGen. In December 2012, Delta Air Lines ordered 40 CRJ900 NextGen worth $1.89 billion with 30 options. In February 2012, Garuda Indonesia ordered six CRJ1000s and took options for another 18. The Danish lessor Nordic Aviation Capital also ordered 12 for Garuda to operate with delivery beginning in 2012. In 2006, the CRJ700 was featured in Microsoft Flight Simulator X as one of the demo aircraft. ^ 225 lb, 102 kg per pax. ^ "World Airliner Census". Flight International, p. 40. 24–30 August 2010. ^ a b Bombardier Program Report. CRJ Series. ^ "List Prices - Commercial Aircraft". Bombardier Aerospace. January 2017. ^ "Commercial Aircraft - Ingenuity in Flight - Bombardier Commercial Aircraft". commercialaircraft.bombardier.com. Retrieved 12 September 2018. ^ David Hughes (13 February 1995). "CF34-8C to power new regional jet". Aviation Week. ^ Graham Warwick (6 Oct 1999). "Bombardier offers to stretch Canadair jet to 90 seats" (PDF). Flight International. ^ "Aero India 2007 Bombardier CRJ900". Archived from the original on 7 February 2013. ^ a b Bombardier (20 June 2017). "The Rise and Rise of Regional Aircraft". FlightGlobal. ^ "2015-2034 market forecast" (PDF). Bombardier Aerospace. 14 June 2015. ^ Bombardier Aerospace (10 May 2016). "CRJ Series New Cabin Design" – via YouTube. ^ Sean Broderick (25 June 2018). "Bombardier Looks Beyond C Series". Aviation Week & Space Technology. ^ Jon Hemmerdinger (22 June 2018). "Bombardier will not replace CRJ's CF34s with new engines". Flightglobal. ^ Hemmerdinger, Jon (15 November 2018). "ANALYSIS: Q400 rises with Bombardier's transport aircraft retreat". Flightglobal.com. Retrieved 15 November 2018. ^ Bogaisky, Jeremy. "Bombardier Sells Aging Q400 Turboprop Line, Cutting 5,000 Jobs As It Sharpens Focus On Business Jets". Forbes. Retrieved 15 November 2018. ^ a b c Frawley, Gerald. "Bombardier CRJ700 & CRJ900" The International Directory of Civil Aircraft, 2003/2004, p. 64. Fishwick, Act: Aerospace Publications, 2003. ISBN 1-875671-58-7. ^ a b "A21EA TCDS" (PDF). September 6, 2018. ^ Baxter, Daniel. 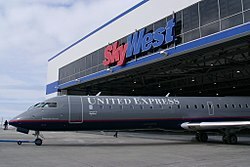 "SkyWest Purchases Four CRJ700 NextGen Regional Jets". Aviation Online Magazine. Archived from the original on 25 May 2016. Retrieved 28 January 2016. ^ "Bombardier Launches New Innovative 50-Seater Aircraft" (Press release). Bombardier. February 6, 2019. ^ "More comfort for more customers: 1,600 new premium seats added" (Press release). United Airlines. February 6, 2019. ^ Hemmerdinger, Jon (6 February 2019). "Bombardier pitches CRJ550 as 'solution' to 700 aging 50-seat jets". Flightglobal.com. ^ "United to add premium seats on regional and mainline jets". Reuters. 2019-02-06. Retrieved 2019-02-11. ^ "Photos of C-FRJX in its various incarnations as first prototypes of the CRJ-700, CRJ-900 and CRJ-1000". Airliners.net. Retrieved 2014-03-03. ^ "The Bombardier CSeries Rolls Out but is it A Game Changer?". Airways News. Airways International, Inc. Archived from the original on 12 March 2016. Retrieved 28 January 2016. ^ Comair—Flying First Class with New Aircraft Archived 25 May 2009 at the Wayback Machine "Archived copy". Archived from the original on 25 May 2009. Retrieved 26 November 2007. CS1 maint: Archived copy as title (link). Comair.com. Retrieved 26 November 2007. ^ "RE220 Auxiliary Power Unit". aerospace.honeywell.com. ^ Aircraft Value News (14 May 2018). "CRJ900 New Pricing Continues to Undermine Used Values". ^ "Chorus Aviation announces expansion of Jazz fleet—CPA covered fleet to increase by 10 incremental growth aircraft by 2017". Newswire. Retrieved 28 January 2016. ^ "Our Fleet". Jazz Aviation. Retrieved 28 January 2016. ^ a b "Bombardier and Chorus Sign Firm Purchase Agreement for up to 10 CRJ900 Aircraft". 26 April 2016. ^ "Bombardier resumes CRJ1000 flight tests". Flightglobal.com. 17 March 2010. Retrieved 17 March 2010. ^ a b "Bombardier to deliver first CRJ1000 on 14 December". Flightglobal.com. 7 December 2010. Retrieved 8 December 2010. ^ Bombardier Aerospace Launches 100-Seat CRJ1000 Regional Jet. Bombardier.com. Retrieved 19 February 2007. ^ "Bombardier CRJ1000 receives two Aircraft Type Certificates". 10 November 2010. Retrieved 10 November 2010. ^ "Bombardier Showcases First Air Nostrum and Brit Air CRJ1000 NextGen Regional Jets". 14 December 2010. Archived from the original on 9 August 2011. Retrieved 2010-12-15. ^ Ranson, Lori (23 December 2010). "CRJ1000 gains type certification from FAA". Flightglobal.com. Retrieved 23 December 2010. ^ "Bombardier CRJ 1000". Business Aviation Group. Retrieved 28 January 2016. ^ "Flying The Distance". Air Transport Publications Ltd. Retrieved 28 January 2016. ^ Aircraft Value News (11 June 2018). "CRJ1000 Values Face Increased Rate of Decline". ^ "Previously Unidentified Customer Trident Jet Orders Four More Bombardier CRJ900 Aircraft Increasing Firm Orders to 12". 25 April 2016. ^ "Bombardier Secures Firm Order for 10 CRJ900 Aircraft". 20 June 2016. ^ "Bombardier Reveals Industrial Bank Financial Leasing as Customer who Ordered 10 CRJ900 Aircraft". 1 November 2016. ^ "Bombardier and CityJet Finalize Purchase Agreement for up to 10 CRJ900 Aircraft". 1 February 2017. ^ "Bombardier and CityJet Confirm Order for four Additional CRJ900 Aircraft". 29 March 2017. ^ "Customer Orders up to Twelve Bombardier CRJ900 Aircraft". 29 December 2017. ^ "Bombardier Signs Contract with American Airlines for 15 Firm CRJ900 Aircraft - Bombardier". www.bombardier.com. ^ "Delta Air Lines Becomes Launch Operator of ATMOSPHÈRE Cabin with New Order for 20 Bombardier CRJ900 - Bombardier". bombardier.com. Retrieved 2018-06-20. ^ "Uganda National Airlines Company Limited Signs Firm Order for Four Bombardier CRJ900 Aircraft". 2018-07-18. ^ "CIB Leasing Converts CRJ Series Order to Add Five 90-Seat Q400". 28 August 2018. ^ "Bombardier Sells Nine CRJ900 Aircraft to Chorus Aviation". 6 February 2019. ^ "United expands premium push with new dual-class CRJ550". 6 February 2019. ^ "Bombardier gets $317M jet order". CBC News. 2 July 2010. ^ Mary Jane (6 December 2012). "Delta Buys 40 Bombardier Regional Jets in Embraer Rebuff". BloombergBusinessweek. Archived from the original on 18 January 2013. Retrieved 29 December 2012. ^ "Nordic Aviation Capital Orders Twelve Bombardier CRJ1000 NextGen Aircraft to be Leased to Garuda Indonesia". Bombardier. 20 June 2012. ^ "CRJ Series Brochure" (PDF). Bombardier. 2017. ^ "CRJ700 Airport Planning Manual" (PDF). Bombardier. 18 December 2013. ^ "CRJ900 Airport Planning Manual" (PDF). Bombardier. 17 December 2015. ^ "CRJ1000 Airport Planning Manual" (PDF). Bombardier. 17 December 2015. ^ "Bombardier CRJ700 Microsoft Flight Simulator X" (PDF). Alitaliavirtual. Retrieved 28 January 2016. 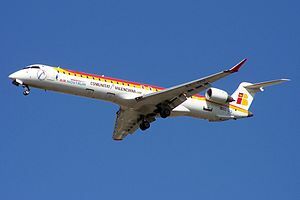 Wikimedia Commons has media related to CRJ700. "Owner's & Operator's Guide: CRJ family" (PDF). Aircraft Commerce. Oct 2009.